Here in Infinite Hospice Care, we value every person that comes through our door. It is our goal to welcome and provide everyone with the best hospice care plan that they need to lead dignified lives and the best-suited palliative care to allow them to continue on with their lives in comfort despite their challenging condition. after-loss and bereavement support for the family. We understand that each patient has unique needs and we try our best to accommodate these requirements via an honest discussion and feedback system among the members of our interdisciplinary team. You can trust that our reliability as an organization and a team made us stay in the industry from the time we started in the year 2012. There are patients with critical cases needing pain management on top of the medications being prescribed by their personal physician. Infinite Hospice Care provides palliative care for patients needing help to alleviate pain and symptoms while in hospice. If pain is managed, these patients get to enjoy the rest of their days making wonderful memories since they can be free of pain and other difficulties. Infinite Hospice Care operates in the area of Encino, California and its neighboring communities. In adherence to the non-discrimination policy, Infinite Hospice Care promotes equality in hospice care delivery. Our staff and management shall uphold the right of clients to equal service provision regardless of gender, color, national origin, religion, race, sexual orientation, age, disability, ancestry or citizenship. 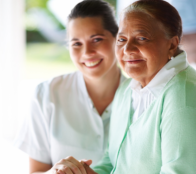 For more details or to request for hospice care, feel free to call us at 818-782-2516. Our line is always open to be of assistance.